In almost all kinds of packed food products, the nutrition fact label is always present. Consumers find nutrition labels important because it gives them information about the nutrients that are present in the food that they are eating. The upper part of the nutrition label varies with the kind of food product. Things such as serving size, servings per container and information about what nutrients are present, are what is called product-specific information. The lower or bottom part of the nutrition label is set for footnotes, which contain daily values (DV) for diets of 2,000 and 2,500 calories. The footnote part provides the recommended dietary facts for major nutrients like sodium, fats and fiber. 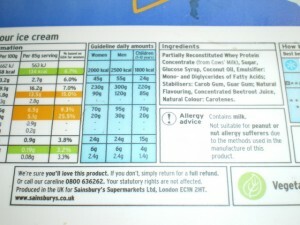 The footnote part can only be found on larger packs of food and is not product-specific, meaning the information contained does not change regardless of what product it is. A serving size has already been standardized in order to make it easier to compare foods that are similar. Serving sizes are expressed in pieces or cups, and then followed by the exact metric amount (for instance, 100 grams). The serving size determines how much nutrients and calories are contained and listed on the food packaging. It is important to pay particular attention to the number of serving sizes that are contained in a package of food. For instance, a pack of macaroni and cheese containing two servings with every serving equal to a cup: if you eat the contents of the whole pack, you would then be eating two cups of macaroni and cheese, doubling the calories listed for a single serving. For people who are on diets and are conscious about the number of calories they should be taking in, it is important that they double-check the serving size that is indicated on the nutrition fact label. Calories offer a measure of the amount of energy a serving of food can give. In the nutrition fact label, there are two types of calories, ‘calories from fat’ and ‘calories.’ Basically, ‘calories from fat’ specifies the amount of calories that can be taken from the fat that is present in that serving of food while ‘calories’ is the total amount of calories present, including those that come from fat. The first nutrients listed on the label are ones that American consumers usually eat in sufficient amounts. It is important to note that there should be a limit in eating these nutrients as eating too much of these can lead to health risks. For instance, consumption of too much fat can lead to heart diseases.